This is a simple, free, and open-source S3 client made by me. Cloud Explorer provides extras that are not found elsewhere in other S3 browsers like search for objects, music player, simple text editor, and image viewer. Users can easily sync folders to their S3 account and upload and download files to their computer. In order to manage your Amazon S3 repository, you need to pay attention when syncing files, because you might end up accidentally deleting important files and overwriting them with others that have different content. This can easily be avoided using Cloud Explorer. The application provides you with several functions, such as object search, media player, text editor and image viewer, along with the possibility to sync your files to and from your remote Amazon S3 storage. It requires Java installed on your computer in order to properly function, along with an Amazon S3 storage account. The program can help you manage the files stored on your Amazon S3 online repository, so that you have the opportunity to revise every file contained by it. Furthermore, you can see the contents of certain files, depending on their format. For instance, you can edit text files and play audio ones, or view images. This is a handy feature, because it allows you to see what you are about to share with others or synchronize on your computer. 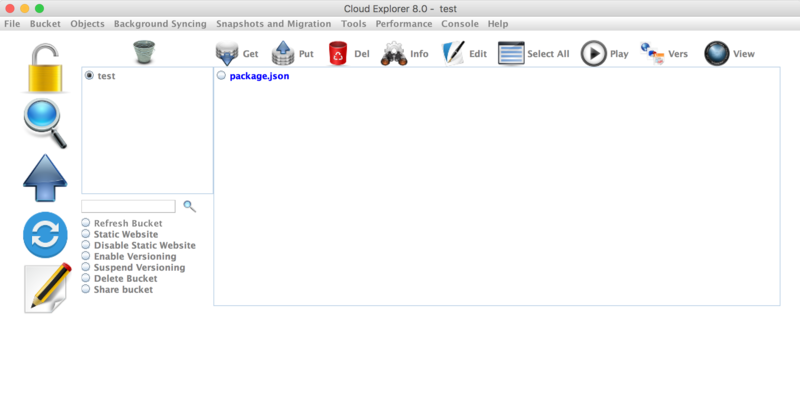 Cloud Explorer provides you with a convenient way of organizing the files from your Amazon S3 online storage. In addition, it helps you synchronize each file with those from your local computer, or the other way around, meaning that you can sync local files with those present on your online repository. With the help of the application, you will have no problems managing files from multiple accounts, as you can sync files from one account with your computer, then synchronize data from your computer with another Amazon S3 repository. To conclude, Cloud Explorer allows you to easily maintain the health and consistency of your files located on your Amazon S3 cloud repository.